There are actually two different minerals referred to as jade – jadeite and nephrite. Nephrite has a silky appearance and is usually found in just a few colours, whereas jadeite has a grainy texture and can be found in lots of colours. Jade was used to make weapons and tools back in the ol’ days! They must have had some very stylish tool kits. But they eventually clocked on to how beautiful jade is, and stopped making weapons and started using it to carve ornaments and jewellery. China is the main producer of jade. It’s also found in Alaska, Australia, Canada, Brazil, New Zealand, Taiwan, Japan and Russia. Jade comes in varied range of colours. It can be found in green, white, black, orange and yellow, sometimes multi-coloured or dappled. It is very rare to find coloured jade stones. Profound colour stones comprise of higher value, but brilliant emerald green is the highest valued jade, which is translucent in nature and recognised as an imperial Jade. 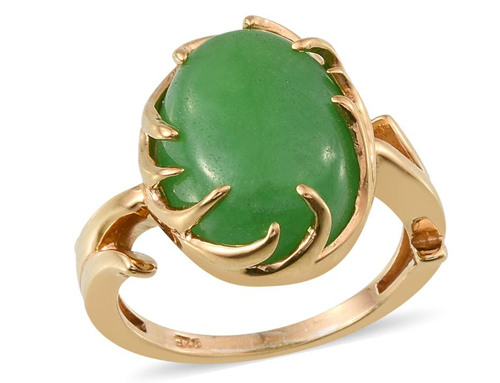 Jade is versatile in nature and can be engraved into various shapes. This exquisite gemstone is generally related to harmony. It supports in developing an inspirational attitude and additionally functions as a safeguard against hazards and adversities. It is also considered as a source of healing energy as it aids in curing of kidney, heart and stomach related complications. It is easy to identify the stone by its fibrous structure as it embodies additional firmness with the compact interlinks grainy structure. Jade is mostly waxed and the heat treatment is used to enhance its colour. Jade is having the vitreous lustre with the hardness of 6.5 to 7 on Moh’s scale and it is mainly sold on the basis of quantity instead of measuring the carat weight of the gemstone.